Working Women Wednesdays featured today on That Business Show. 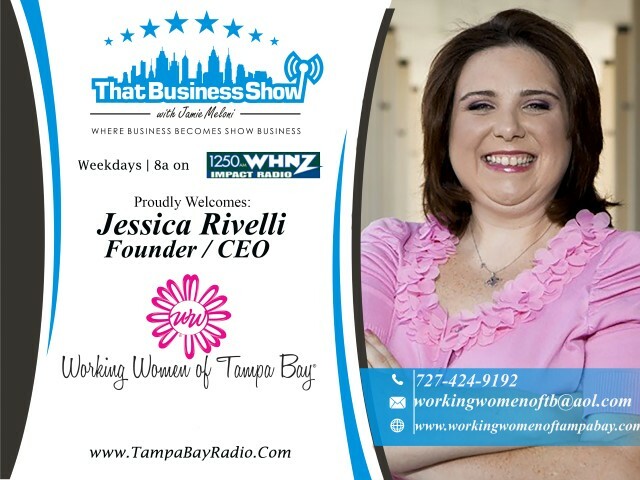 CEO and founder of Working Women of Tampa Bay, Jessica Rivelli opened up the hour and discussed her new program designed to assist budding women entrepreneurs grow their idea and business. Through Working Women of Tampa Bay, Jessica and her group of professionals offer an excellent resource to members in all areas of business and this is another one of the many resources offered by Working Women of Tampa Bay. Learn more at http://www.workingwomenoftampabay.com and click on their events calendar link to see all of the many programs and workshops coming up, there is definitely something there that will help you grow your business! 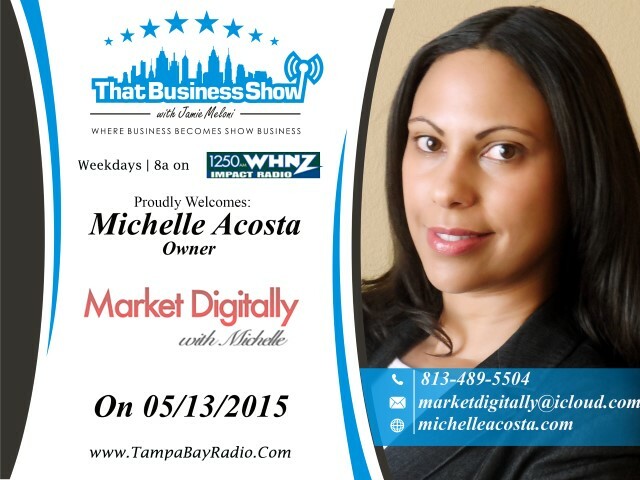 My 2nd guest was Michelle Acosta, Owner of Market Digitally. Michelle shared with us tips on making your site mobile friendly and touched on the keys to the start up for the new business owner in the digital marketing space. Michelle is highly adept in the area of digital marketing and has over 15 years of experience in the field and launched Market Digitally after an exciting and successful career in corporate and non-profit public relations marketing. She takes those experiences along with many others and utilizes them to assist clients with finding their competitive edge and how to inspire their audiences through the use of effective digital marketing. She offers services from website design and SEO to digital marketing strategy consulting. Michelle is also a regular presenter with the Working Women of Tampa Bay and you can hear some great digital marketing tips every Thursday each month as she speaks as part of a Mastermind Group with the Working Women of Tampa Bay held in Tampa at Oasis Outsourcing, located off Waters Ave by N. Dale Mabry. Reach out to Michelle at 813-489-5504 or email at marketdigitally@icloud.com for ways she can help support your business and visit http://www.michelleacosta.com for more information! 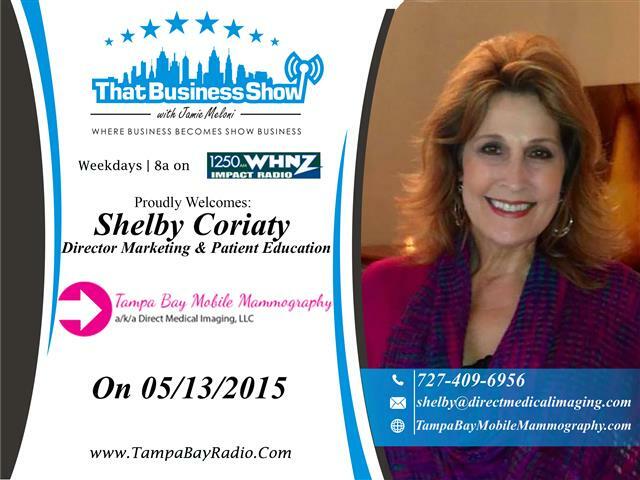 The 2nd half of the show was all about breast cancer awareness and tips as Shelby Coriaty, Director of Marketing and Patient Education with Tampa Bay Mobile Mammography, joined me in studio. Shelby was diagnosed with Stage 3 Breast Cancer shortly after her 40th birthday and through an extensive 5 year battle was able to defeat and overcome this terrible disease. Through this experience, she learned a great deal about cancer and became inspired to help others facing this disease as well as to educate and inform others on proper preventative measures. In 2007 she began to volunteer her time to the University Community Hospital (now the Florida Hospital Tampa) to help promote their new Breast Care Cancer Center and in 2014 joined Tampa Bay Mobile Mammography as their Director of Patient Education/Marketing. Shelby shares her story and some tips on breast cancer awareness on this segment including her own story of how she was not conducting her self-exams properly which led to a delay in her diagnosis. Shelby and Tampa Bay Mobile Mammography provides free breast health seminars to businesses and the community and they work closely with Corporate Wellness Directors to establish employee screening programs. Learn more at http://www.tampabaymobilemammography.com for ways to schedule an appointment and you can reach Shelby directly at 727-409-6956 or email at Shelby@directmedicalimaging.com!